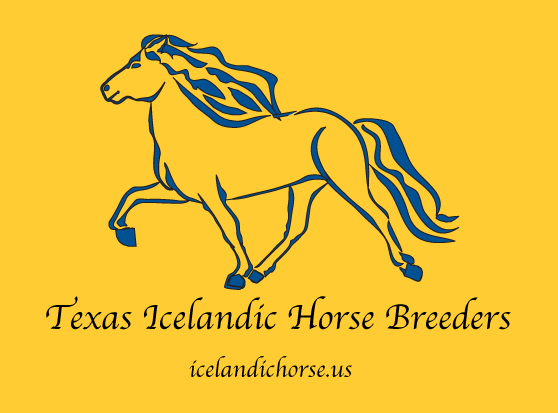 LoneStar: USA Icelandic Horses for Sale (Breeders): The Texas, United States of America, Icelandic Horses Breeding Farm-see Sales If you have a old browser, you are up the creek so to speak. 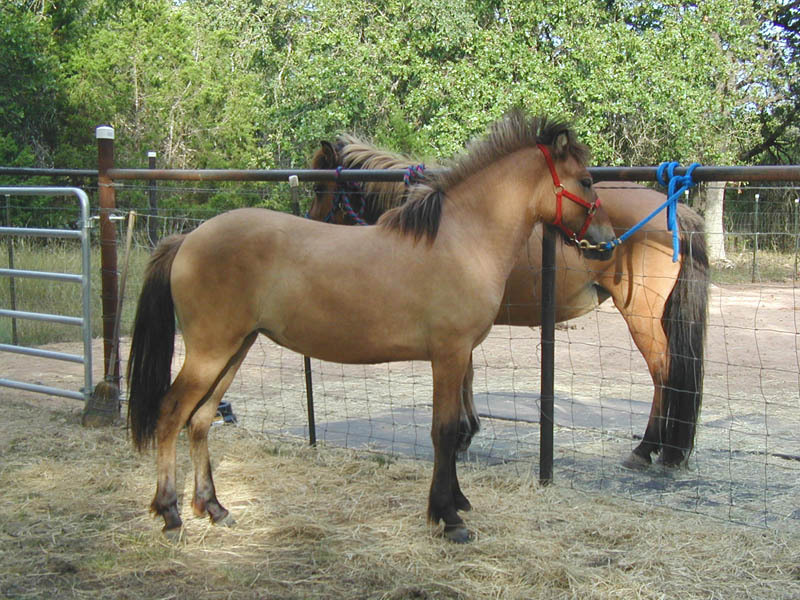 At LoneStar (USA US Icelandic Horses-Sales/Breeders), we breed quality Icelandic horses for the American market that attempt to achieve the best conformation, temperament and talent that is possible with the breeding stallions available to us. 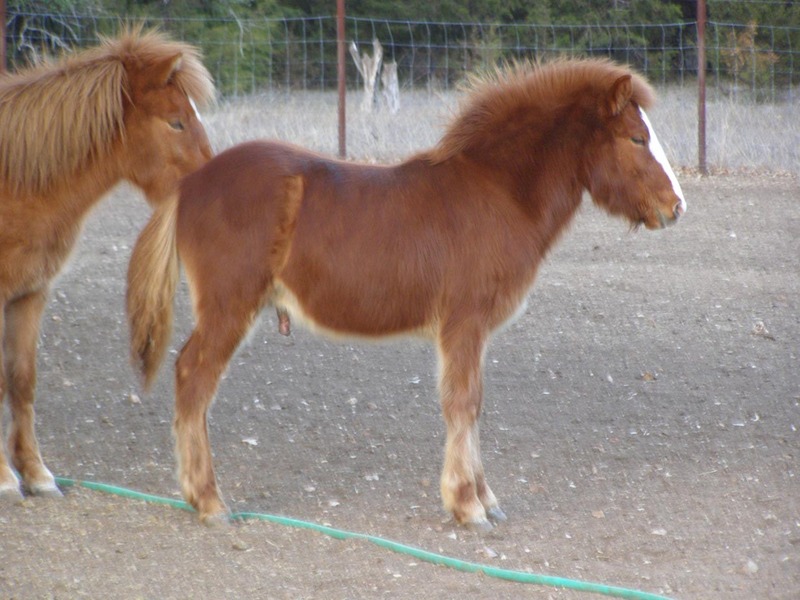 We are attempting to be one of the premier Icelandic horse breeding farms in the south central (southern) United States of America (US USA). We have well bred quality mares and stallions for sale. and perhaps Ljufa (half Kolkuos). We have four registered Icelandic stallions that will be capable of breeding as of the summer of 2009: Stefnir, Tappi, Leikur and Sjoli. All are sired from 1st prize stallions. Stefnir's father is a World Tolt Champion, known for the quality of his beat. Stefnir has just enough pace to have a very good clean tolt, even barefooted. Tappi is the offspring of Hilmir fra Saudarkroki, who has a 9.5 for flying pace. 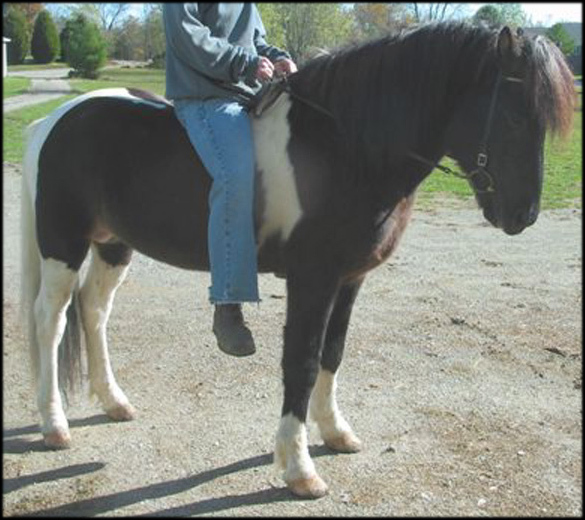 Tappi is very five gaited, as he shows all gaits in the pasture. Tappi already has received a "first prize" rating for conformation. We plan on having Tappi evaluated for talent in the future. 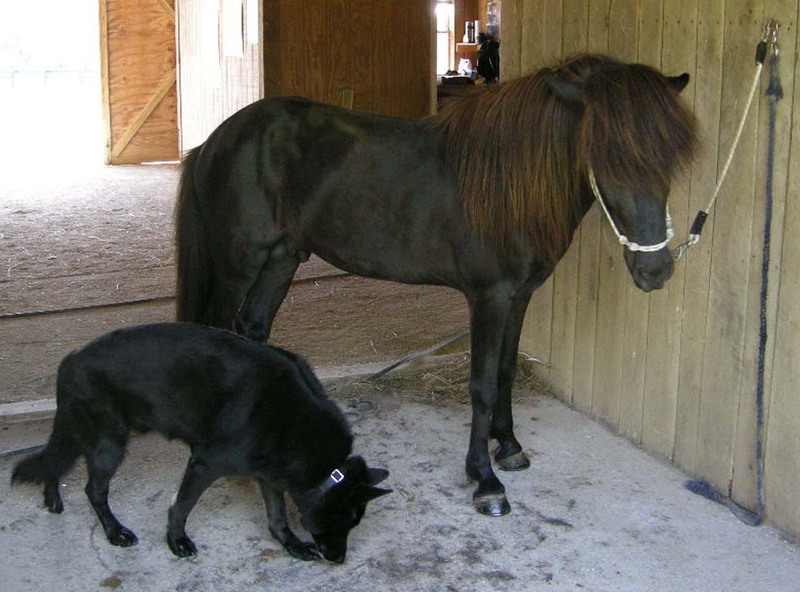 Leikur is Tappi's younger five gaited brother. He lifts to the horizontal under himself, and he has very good confirmation and very collected impressive movements. Sjoli is the son of the highest evaluated four gaited stallion in the world, i.e. Tigull. He has become a beautiful stallion. 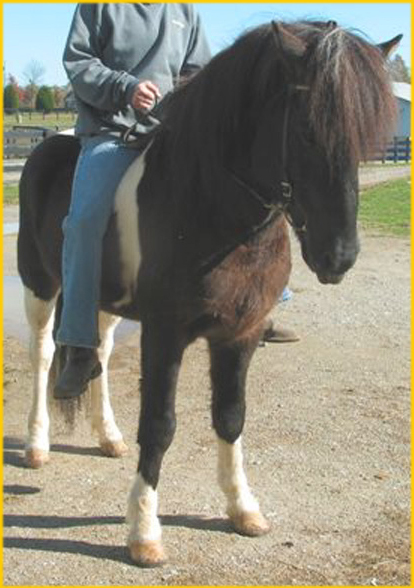 We believe that Sjoli will be four gaited, or at most, like Stefnir, marginally five gaited. Sjoli can literially dance as he moves. He has great suspension in his trot. He cover a lot of ground in this gait, as he is very powerful for such a young age. 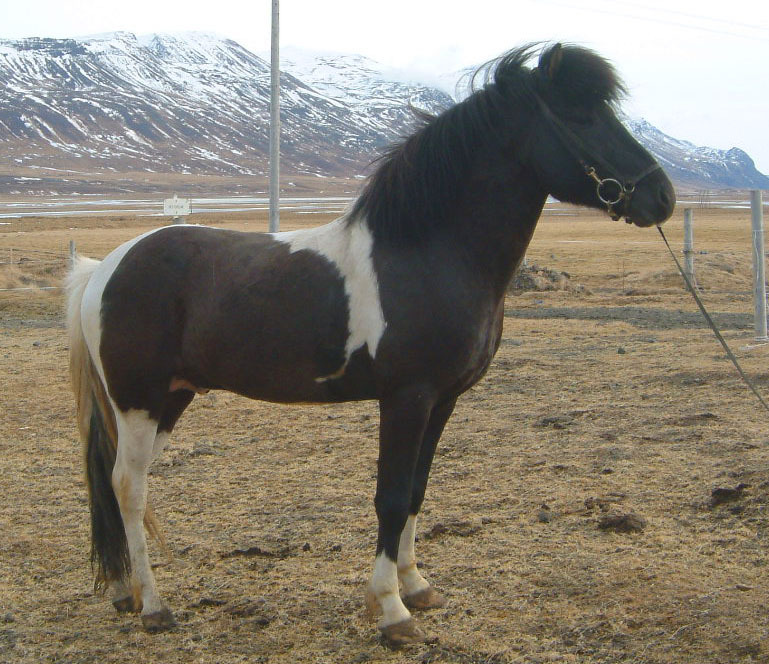 We have a number of very well bred Icelandic horses for sale: two stout young mares and two promising stallions and geldings (ages 2, 5 & 7 years). 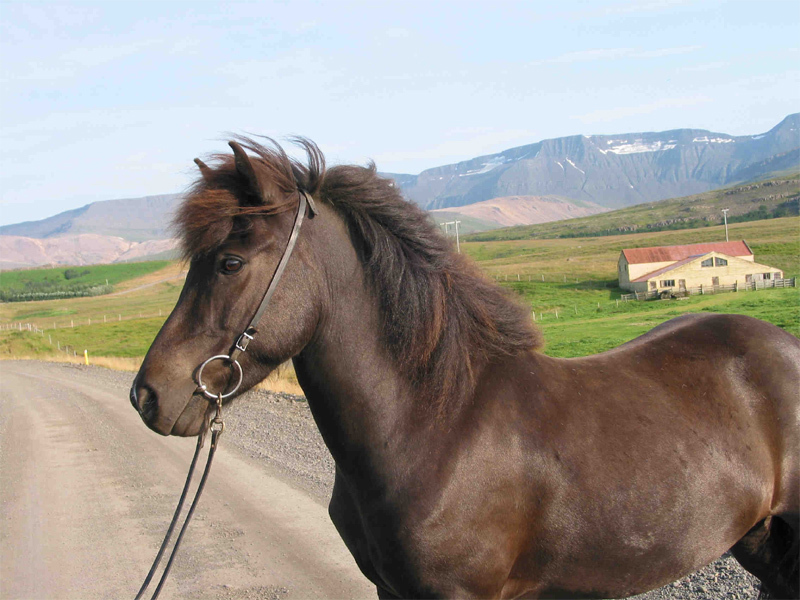 See our Icelandic Horses Sales List. Give us a call at 512-930-7070 (cental Texas)... best time is 1pm-8pm CT.
512-930-7070, best time to call is afternoons or evenings. Her sire is Rodull fra Akureyri, was a rather special "proud" large chestnut Kolkuos stallion. 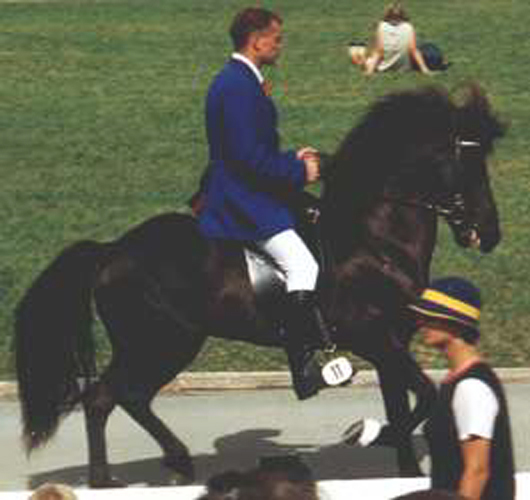 Rodull's father, Kristall fra Kolkuosi, was a 4 gaited competition stallion, that had a 9.5 for tolt. 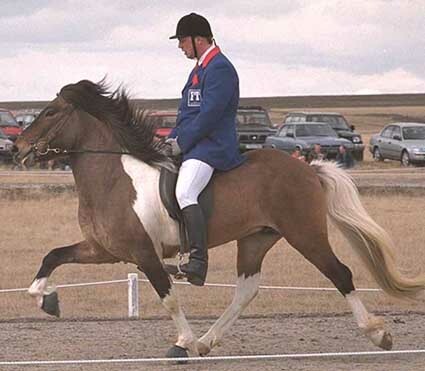 Rodull fra Akureyri, Elja's father, a first prize Kolkuos stallion. Rodull was well over 14 hands 2 inches, very tall. We have three very well bred young Icelandic Sheepdog males available. Fengur won the WC because his beat was perfect. He did not have the hightest lift. Stefnir has the same quality. His tolt is perfectly clean even when he is barefoot. received an 8 on each of his riding scores, except 7 for pace, 7.5 for trot and 8.5 for walk. his rider. Stefnir is without faults. We are very pleased to have Stefnir join us in Texas. He is producing very nice offspring. 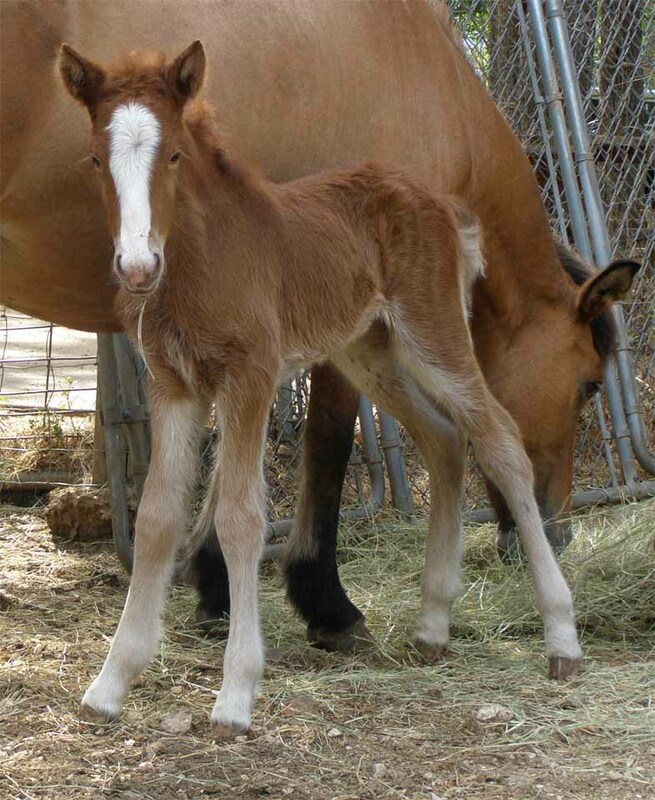 Stefnir's first colt, born here at LoneStar (Tjaldari), literally tolted out of the womb. to the best mares that he has ever had the opportunity to breed. 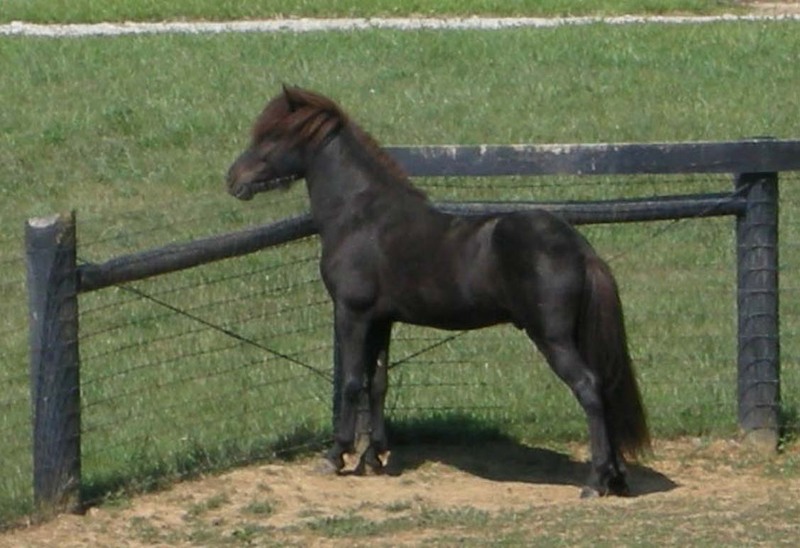 he should go well with any Icelandic mare, either four or five gaited. Stefnir is a proven stallion, both in Iceland and in the US. 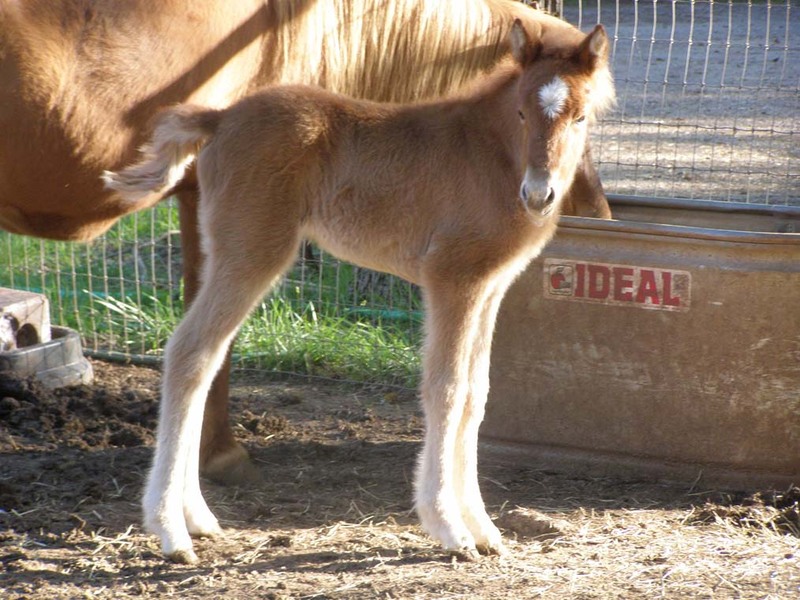 Live foal guarantee included. AI is a possibility. 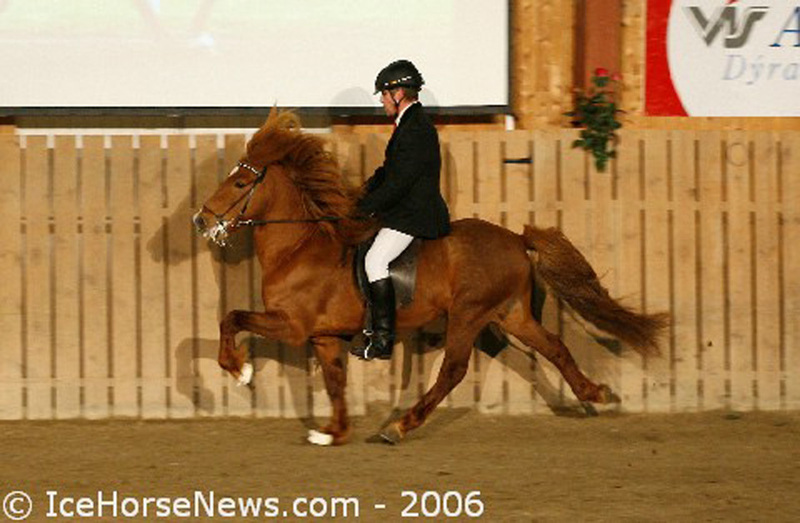 the first 1st prize Icelandic mare to have received an honor prize for her offspring. 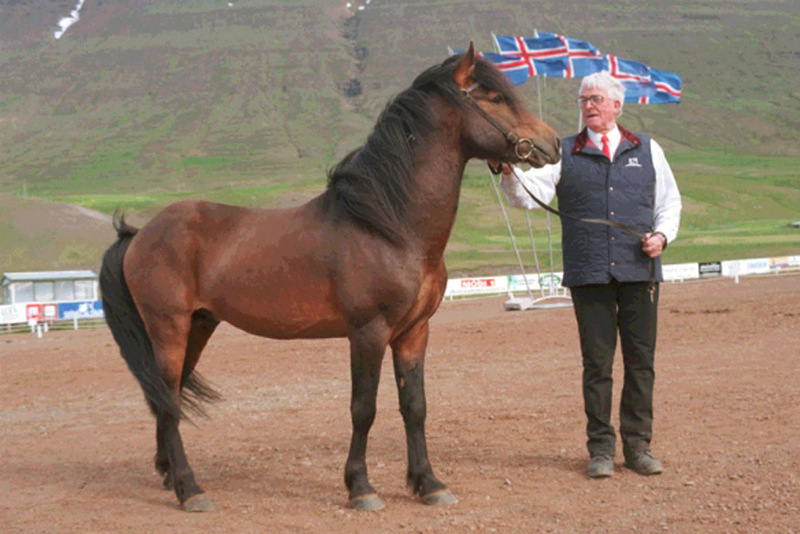 Orri frá Þúfu) and Dalvik frá Litlagarði, a first prize competition mare. 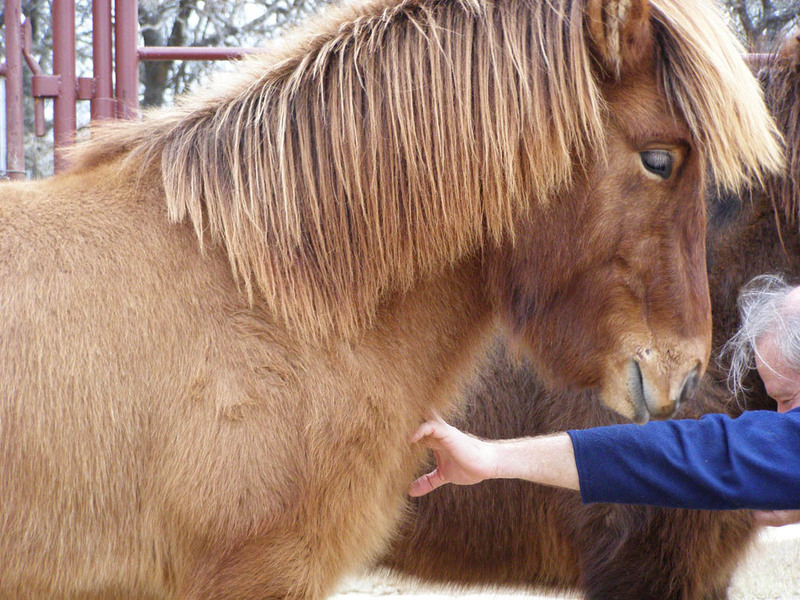 Rut was bred to Asi frá Kálfholti and their foal has arrived (2007): Stássa. 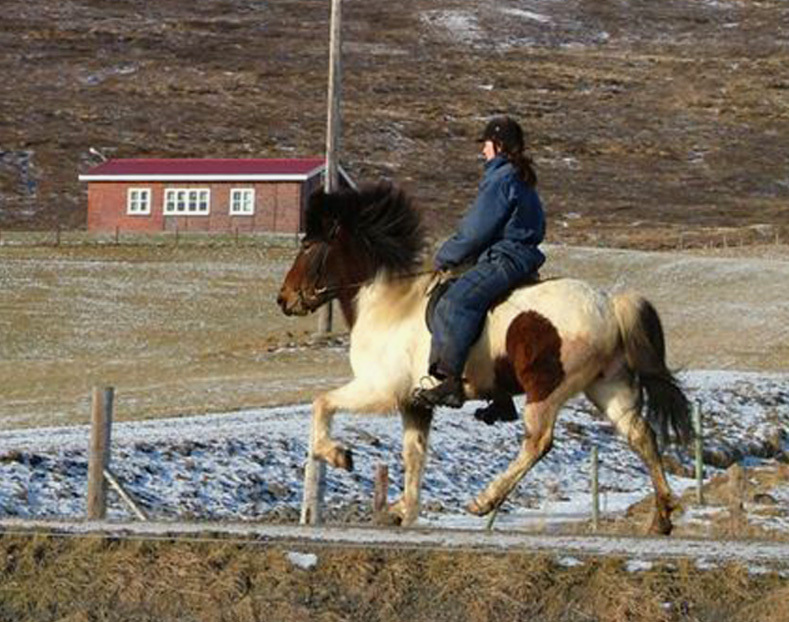 Rut is the granddaughter of Orri frá Þúfu, the most famous breeding stallion in Iceland. a pinto is possible. This will be the best mare that Stefnir has ever been bred to. 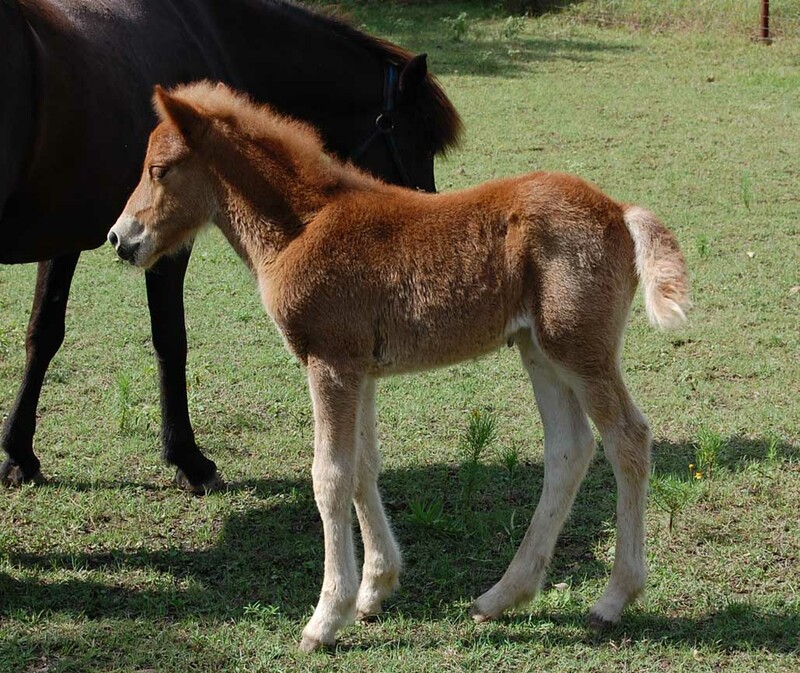 We are really looking forward to seeing this foal, after what we've seen in Tjaldari. Rut is quite overweight in this picture and very little trained, though the talent shows through. Dalvik frá Litlagarði, mother of Rut, 1st prize competition mare. Rut has had her foal by Asi frá Kálfholti, talent=8.38, 8.5-tolt, 9.5-trot. 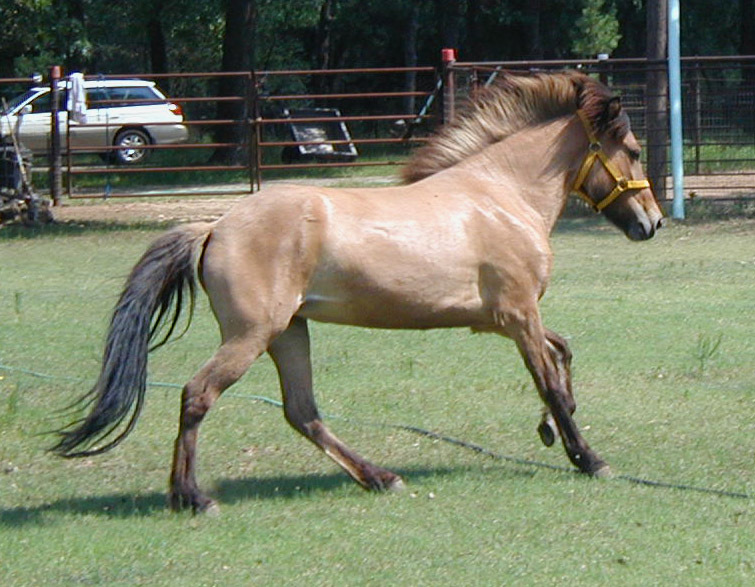 Asi is known for producing horses with very good movements. 9 for gallop, spirit & general impressions, an over all 8.6 for talent. Asi is a very strong breeding stallion. to produce the best possible offspring with top quality competition potential. We intend to breed Rut, Ósk and Sæta to Sjoli in 2010. 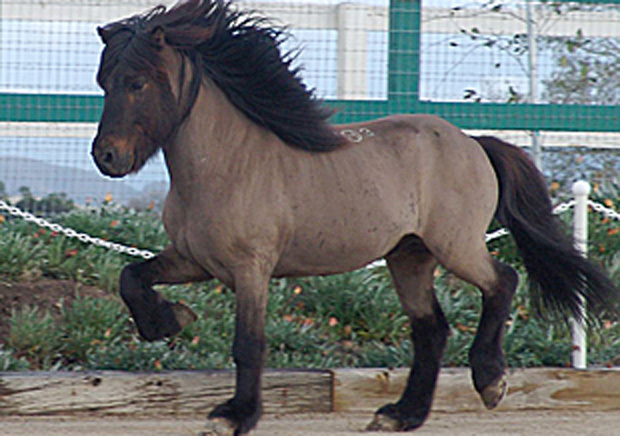 Tígull is a four gaited stallion, with an overall score of 8.6. He is sired by Stígandi frá Sauðárkróki. 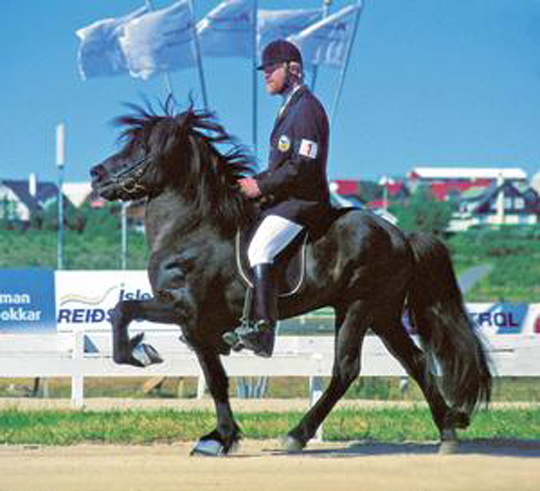 Tígull is the highest evaluated four gaited Icelandic stallion in the world. 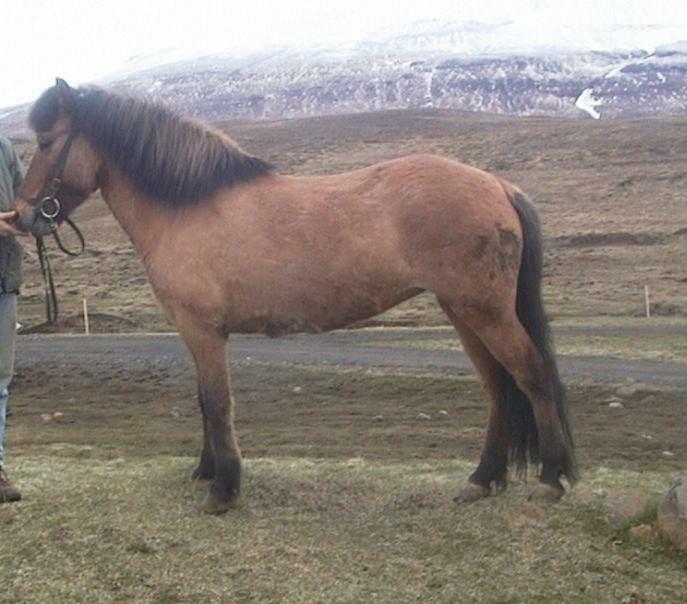 [ Gyðja (our mare below) is also sired by Stígandi frá Sauðárkróki. 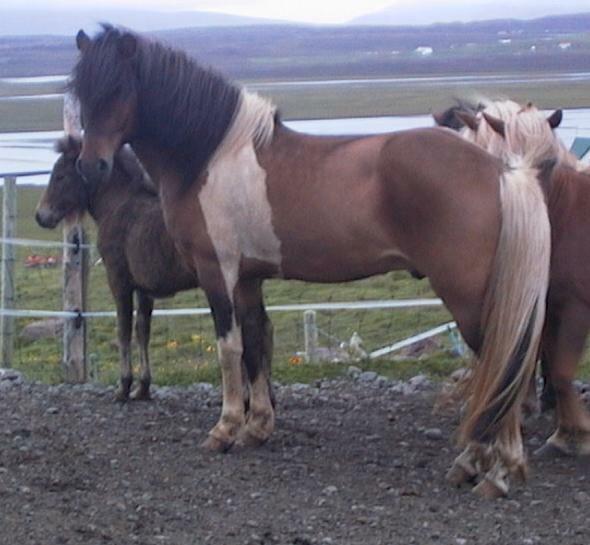 We have two young stallions out of Gyðja: Tappi and Leikur, see "Young Ones". 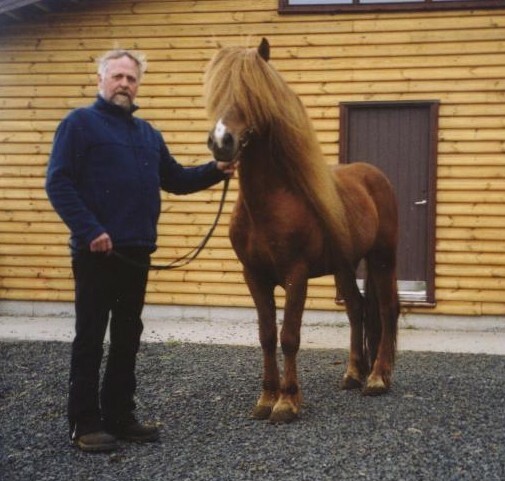 This is Stígur frá Kjartanstöðum, an honorary first prize stallion. mare is Terna frá Kirkjubæ, both of which had many impressive offspring. Terna is the daughter of Hlynur frá Kirkjubæ, a brother of Þáttur frá Kirkjub 30. Stígur is also the father of our Þrá frá Akureyri. Þrá frá Akureyri. 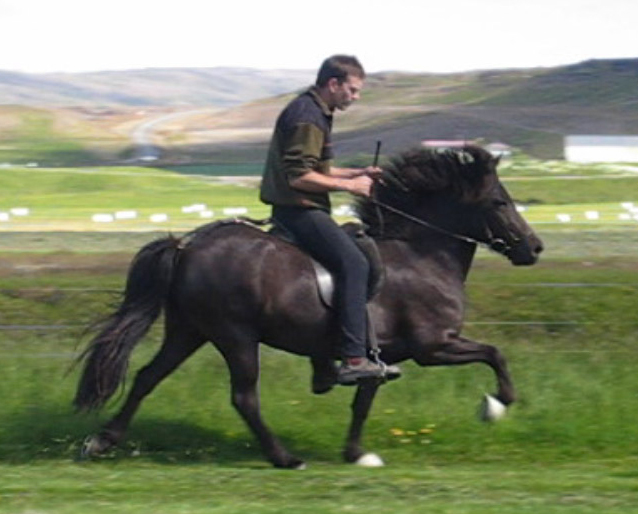 Þrá is a very high stepping four-gaited mare. nature makes her a safe and reliable trail and show horse. Further, her quality bloodlines make her an excellent broodmare. We are very fortunate to have such a mare come to the US for breeding. 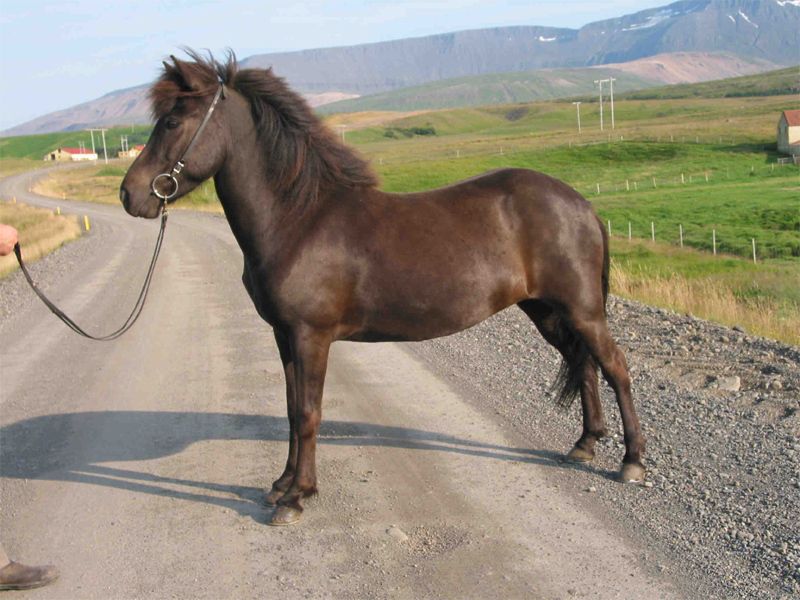 Þrá is foundation mare quality. We hope to build upon that linage here in Texas. Þrá had her foal by Tígull frá Gygjarhóli. with an 8.54 for both his talent and conformation scores. She should foal in 2009. Óskar frá Litla-Dal, a first prize stallion with an 8.54 for both his talent & conformation scores. Óskar is 14 hands tall. Harpa is very strong and energetic like her sire, though she also listens to her rider. Harpa is both quite young and also quite friendly, though she can really move! quite engertic. Mánadís has also inherited Moli's lift and she can really move!!! Harpa is now confirmed pregnant by Stefnir for a 2009 foal. 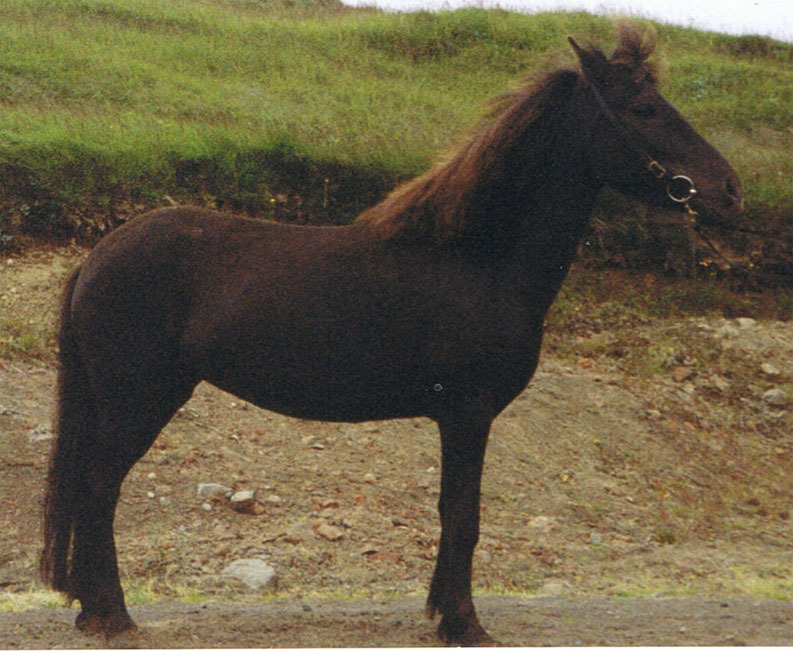 Harpa may be bred to either Stari or Stígandi frá Leysingjastoðum in 2009. They're called Ice-land-ic horses for more than just one reason. That's ICE that Moli is being ridden on, with foot lift to his chest. and general impressions. Moli, like his father Glampi, has huge movements. trot, and 9.0 for tolt, spirit and general impressions, with an 8.5 for gallop. Skrytla frá Böðmóðsstöðum is a very talented mare. Her sire had a 9 for tolt, galop & general impressions. She is a power house! You want to go faster? Just let out a little rein. You never have need of either leg or crop. She is confirmed pregnant to Stefnir for a 2009 foal. 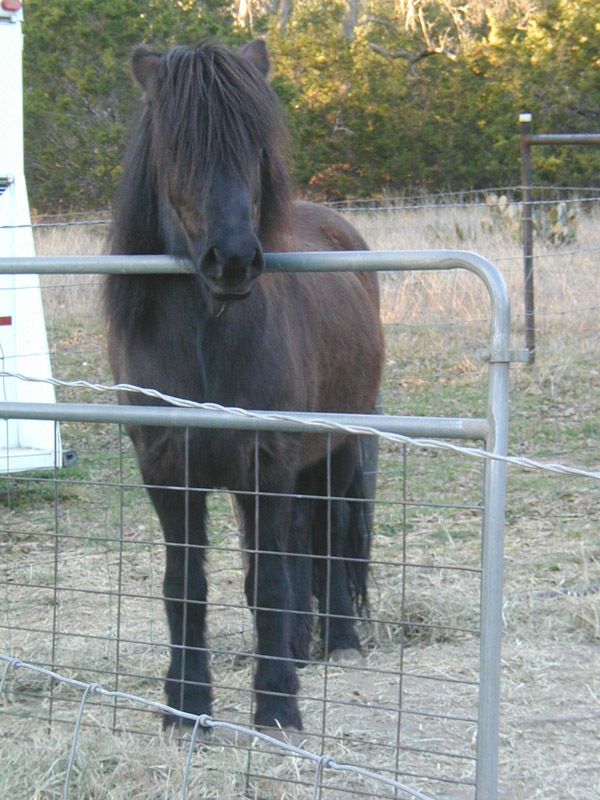 Ósk frá Árholti, a bay dun Icelandic mare, my first Icelandic mare, arrived in Texas 2001. She's 13 hands 2 inches, about 12 years old, 4 gaited. 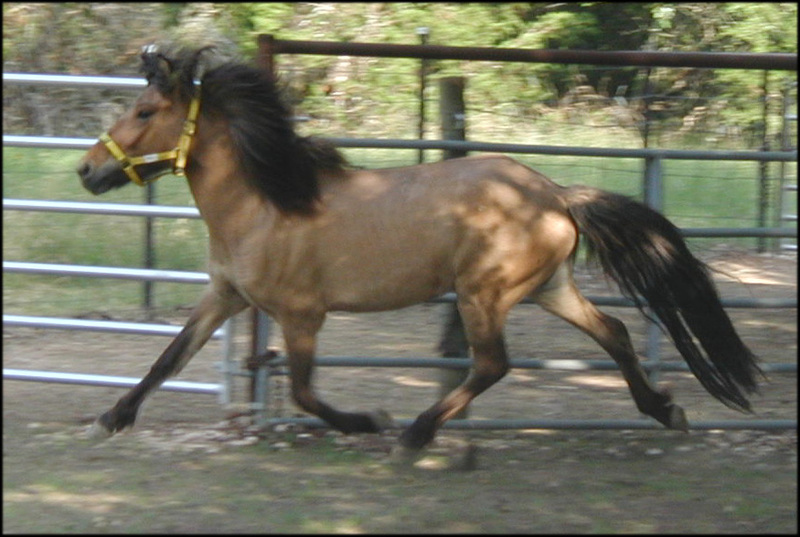 Ósk's 2nd foal arrived in May 2005, See Krunur under "Young Ones". Sæta is her first foal out of Hilmir frá Sauðárkróki. 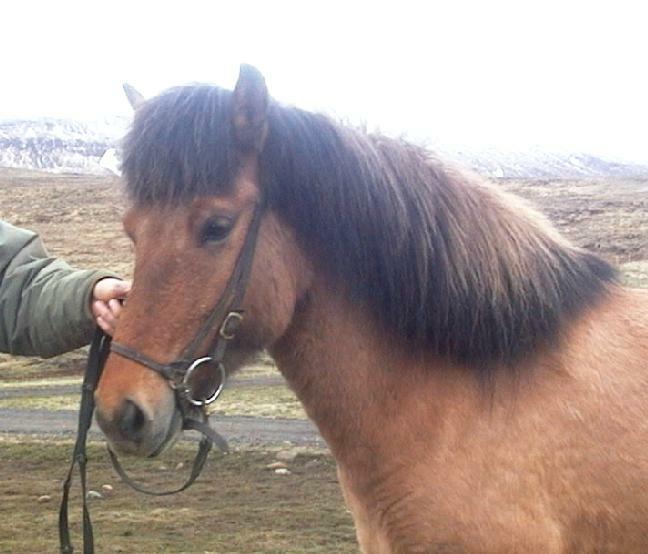 Her 1st foal by Stefnir arrived April 2007, see Blíða frá LoneStar under "Young Ones". Ósk second foal by Stefnir arrived June, 2008. See Tjaldari under "Young Ones". Ósk is producing some very nice offspring. I'm quite impressed with them. the highest evaluated four gaited stallion in the US: 8.63 for conformation. 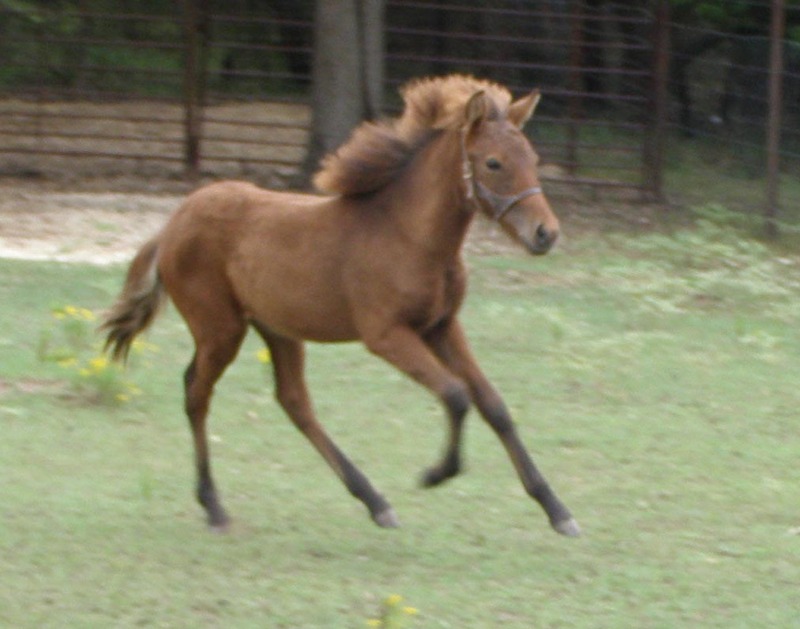 This is Gyðja frá Víðimel, arrive in the US in 2002, who also has a foal sired by Hilmir frá Sauðárkróki. for conformation at evaluations, age 4. Pure Kolkuos/Austanvatna bloodlines. 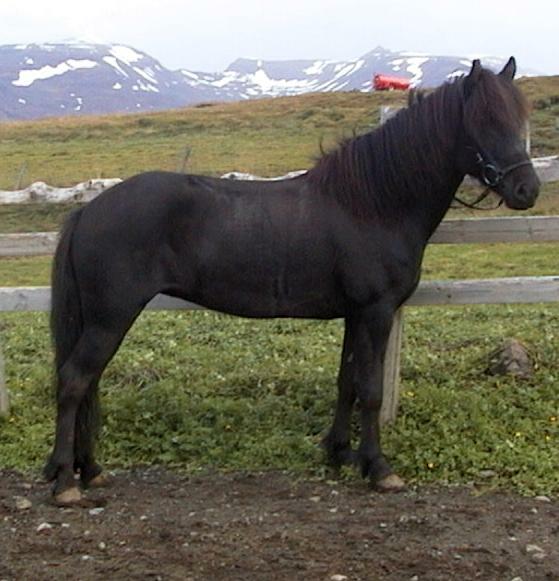 Gyðja is sired by Stígandi frá Sauðárkróki (honorary 1st prize stallion). Gyðja's 3rd foal arrived in late May 2005, see Leikur under "Young Ones". She has had only stallion prospects, one of which was in Iceland. 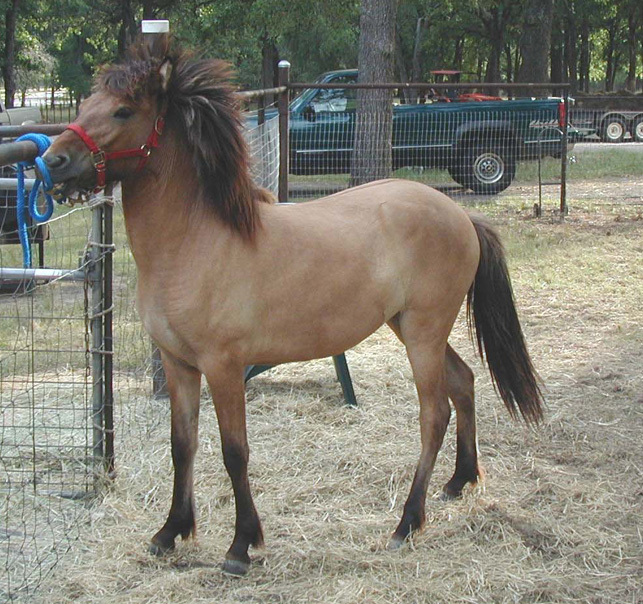 Gyðja has been bred to Stefnir for a 2009 foal. Below is Stígandi frá Sauðárkróki, Tigull's and Gyðja's sire. Sæta, 6 years old, daughter of Ósk & Hilmir frá Sauðárkróki. suspension in her gaits. We have elevated expectations for Sæta. The color of all my bay duns are like buckskin, which is somewhat rare in Icelandics. bends well and is rather forward going. 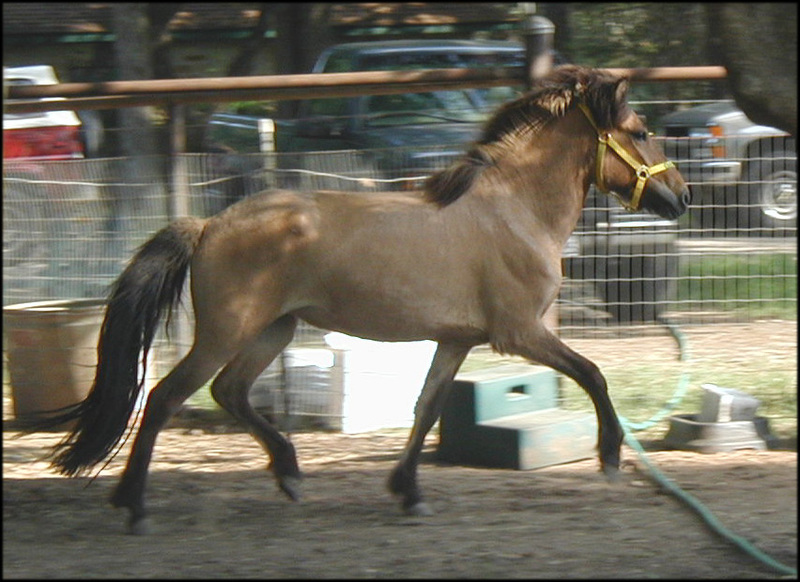 Sæta will be bred to Stari frá Bredhall in 2009 after her gait training. These two pictures were taken when she was only 13 months old. These were taken June, 2005, at almost three years of age. Sæta at almost five years of age, June 2007. Currently Sæta has completed her initial training and is under saddle. 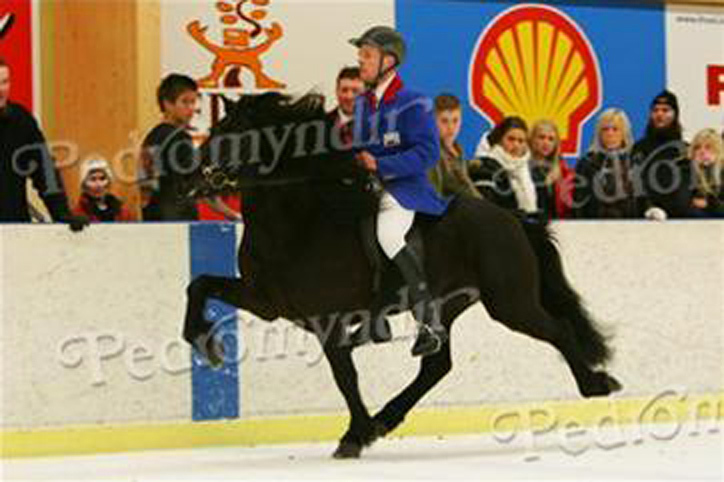 a first prize bay dun pinto Icelandic stallion with a 9.5 for flying pace. Tjaldari, a young stallion sired by our stallion, Stefnir and foaled by our mare Ósk. 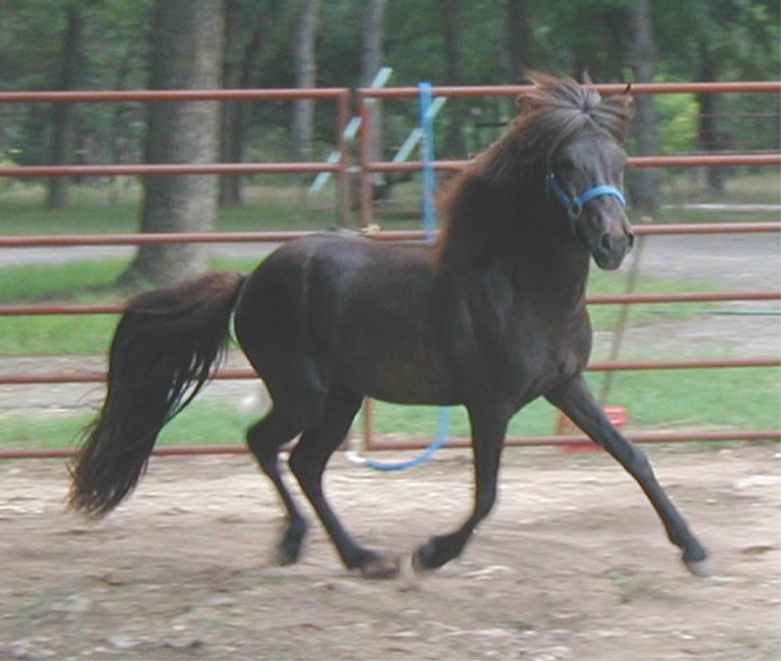 Tjaldari can trace his ancestry to Hrafn frá Holtsmúla (stallion 802) via both Sire & Dam. 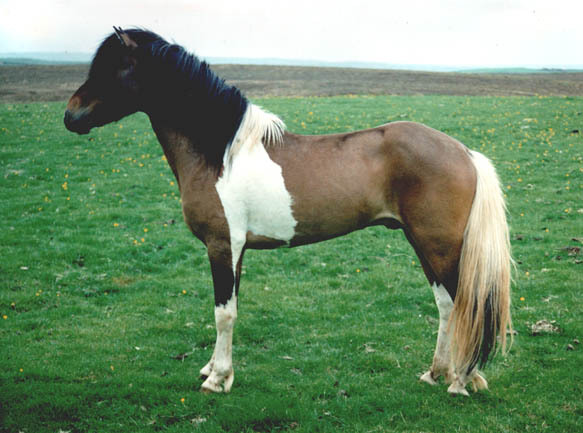 This is a very nice young stout dark chestnut stallion with very nice conformation. He is the most lateral moving offspring that we have yet seen out of either Stefnir or Ósk. Tjaldari has been tolting since he was just hours old. 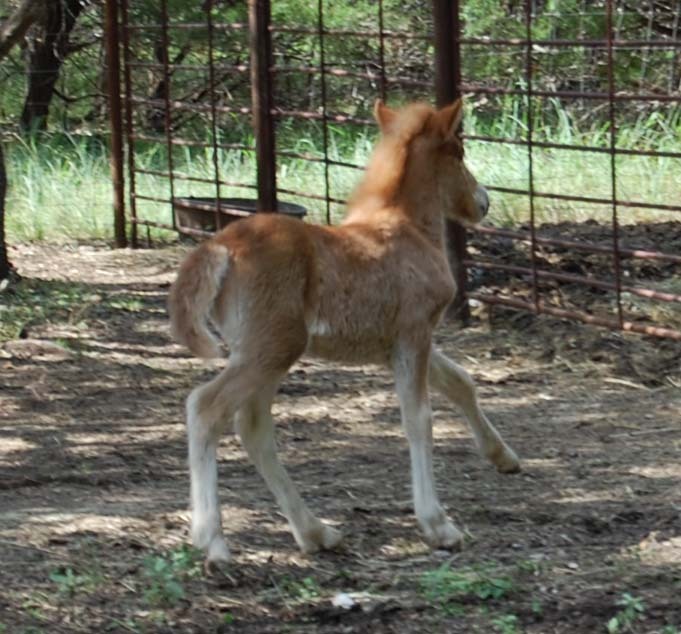 We expect him to be 5 gaited. 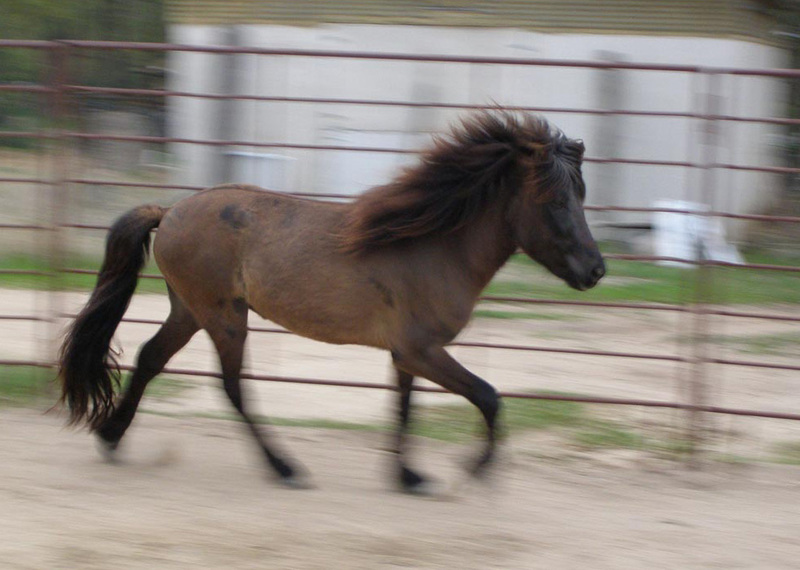 young stallion with very nice movements, aka T.J. :-) At 6 months, he's about 450lb. 1st picture below was taken at age of about 12 hours. A well fed TJ hanging out with his small herd of four yearling mares. He's six months old. 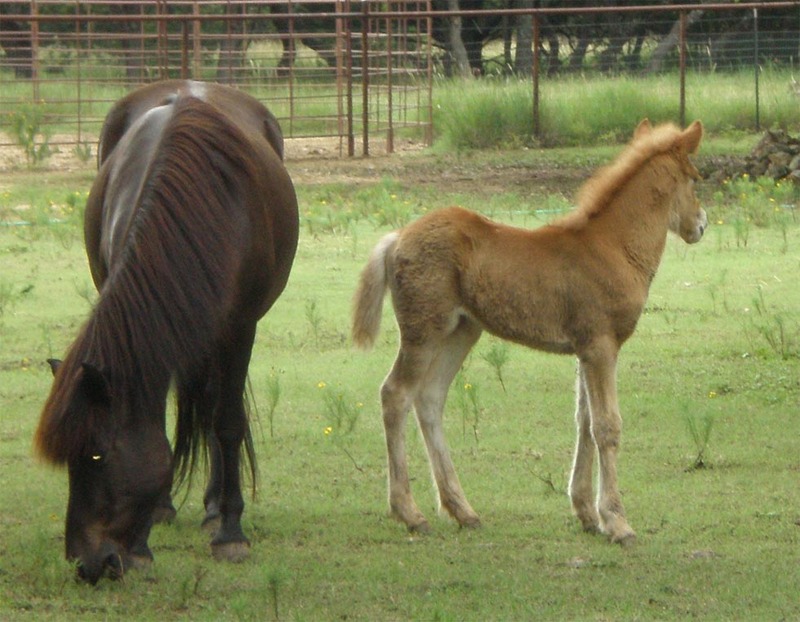 We have had five foals in 2007. Three out of top quality breeding stock. 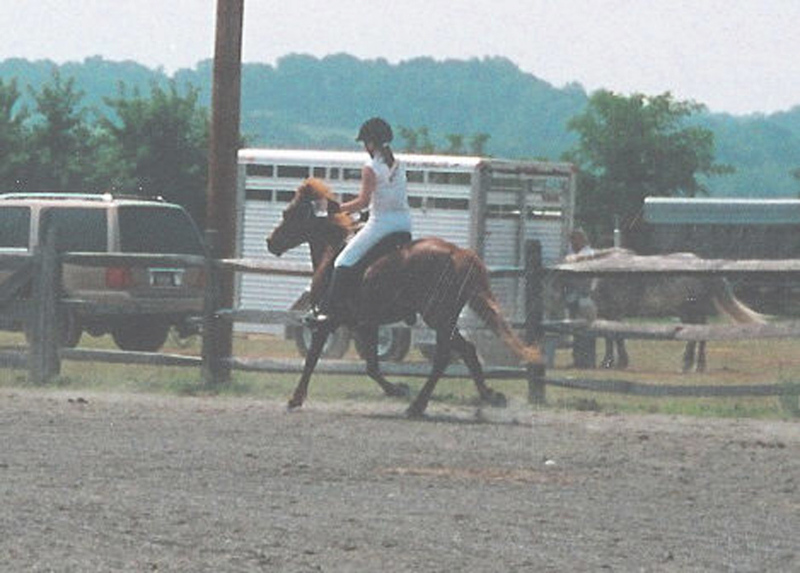 July 13th, 2007: a chestnut filly with a star! 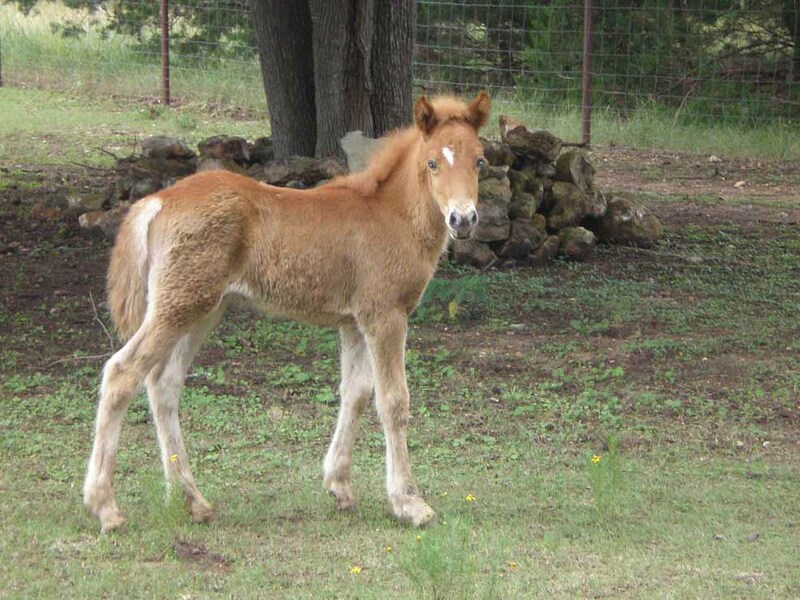 She will have a flaxen mane like Asi. mare, i.e. very strong like her mother, Rut. She is NOT for sale. 1st two pictures taken at ten days of age. 2nd two pictures taken at two weeks of age. He is the offspring of Þrá & Tígull arrived 5-26-07, a dark red bay colt. Grandsires: Stígandi frá Sauðárkróki and Stígur frá Kjartanstöðu m.
Both of which have an honor prize for their offspring. Pics taken at three months of age. Sjóli is looking very good. Sjóli means "king, duke". Sjóli exudes nobility. He is NOT for sale. He is already larger than Leikur, who is 2 years older. Picture taken day one. Mánadís is now 18+ months old. Mánadís has very flashy movemnets with four white stocking feet. Mánadís has inherited some of her grandsire's fire. She is quite engertic. Mánadís has also inherited Moli's lift and she can really move!! She is five gatied and gaits most of the time. In fast tolt, she lifts to the horizontal. Mánadís is not for sale. Blíða is showing very good movements & has a unique dark dun color. She is a yearling and weighs over 600 lb. Blíða is for sale. for the young mares. Currently Blíða is showing a very fast fluid trot. Picture below taken on her birth day. She will only be sold to good home. defined eel stripe, a flaxen/silverish mane, a large star and a small snip. She is 18+ months old and weighs well over 550lb. She is always in motion. 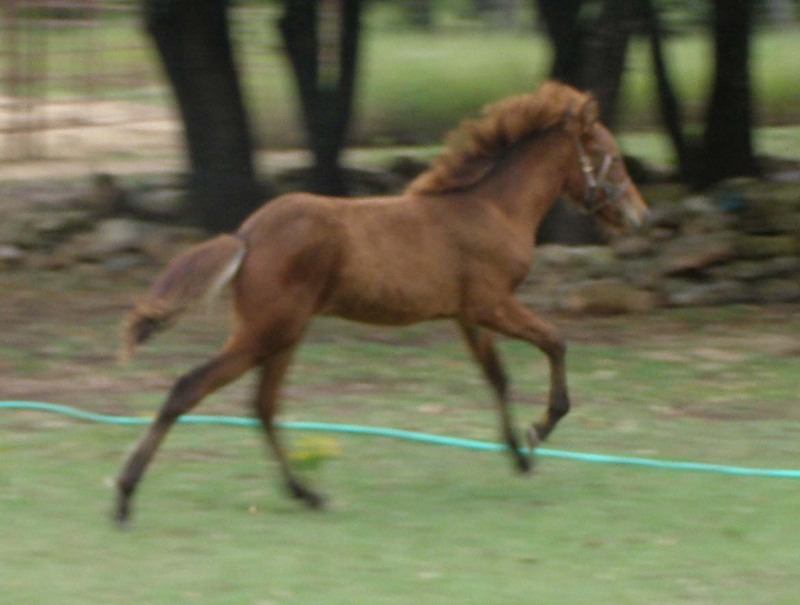 She has a very nice prancy trot with nice lift and she is very forward going. of the action and has a very active personalty. Ljúfa means "mild and gentle one". Ljúfa's mother, Elja is out of the Kolkuos line, pure Kolkuos & Svadastadir. Ljúfa is. She is a very sweet girl. Ljúfa is for sale, to an acceptable home only. Picture below taken a few days after her birth. 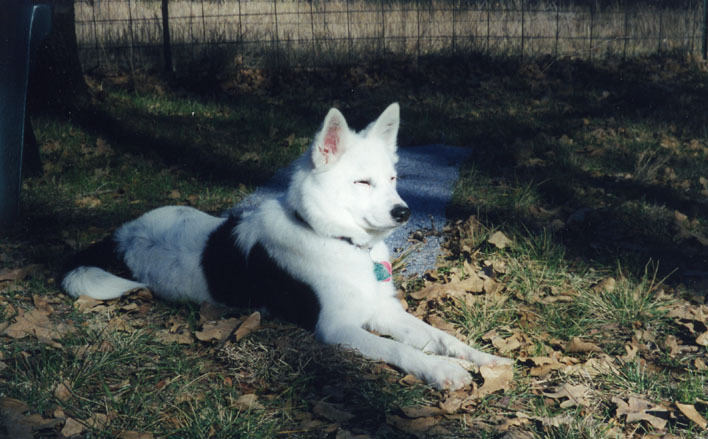 Krunur is a light bay dun, very similar to his half sister, Sæta (see below). a rather rare and beautiful color. Krunur has two red stripes on both of his shoulders. He is 2+ years of real age. Krunur at just 26 months of age. 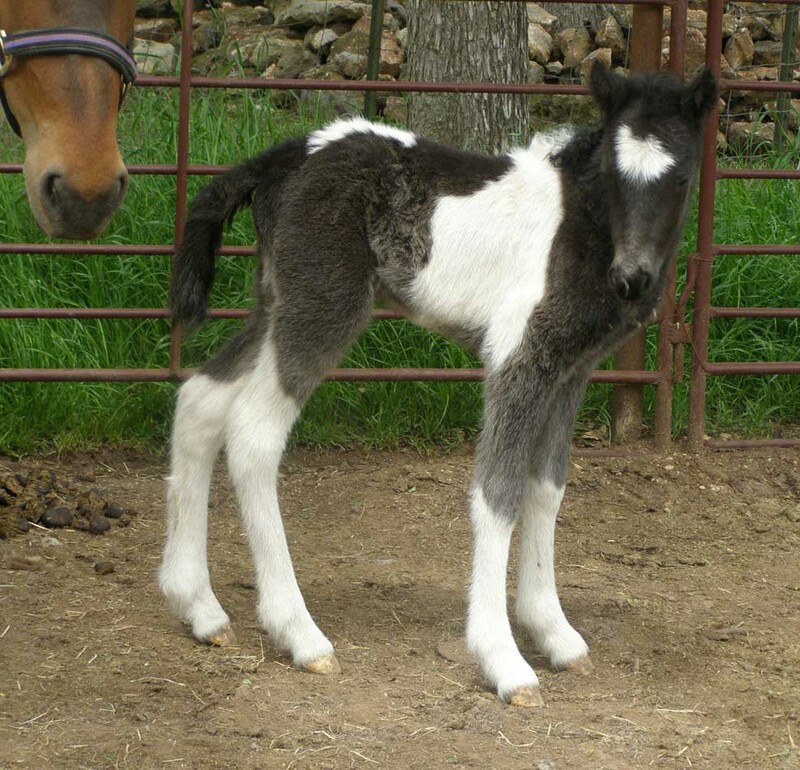 This is Gyjda's latest pale black colt, named Leikur (playful), born June 9th, 2005. Leikur is already showing very good movements and agility, including all gaits. foal I've yet seen at that age. He is the most talented of the 3 young colts of 2005. Leikur is 3.5 years of age. He is a very friendly guy and is quite personable. His mane almost comes to bottom of belly now, with longer forelocks than below. Leikur's sire has an 8.57 for talent. I've fatten'd him up some for winter, which shows a bit in these pictures. These 2 pics were taken on Thanksgiving, 2008. Leikur is about 42 months old. Leikur's eel stripe is just visible. He gaits most of the time. Pic taken at 31 months. Leikur is looking a lot like Tappi, his older brother. Leikur's mane now covers his neck. He has quite high leg lift and he can move very energetically. This is a stunning stallion! Note the lean build & long legs. 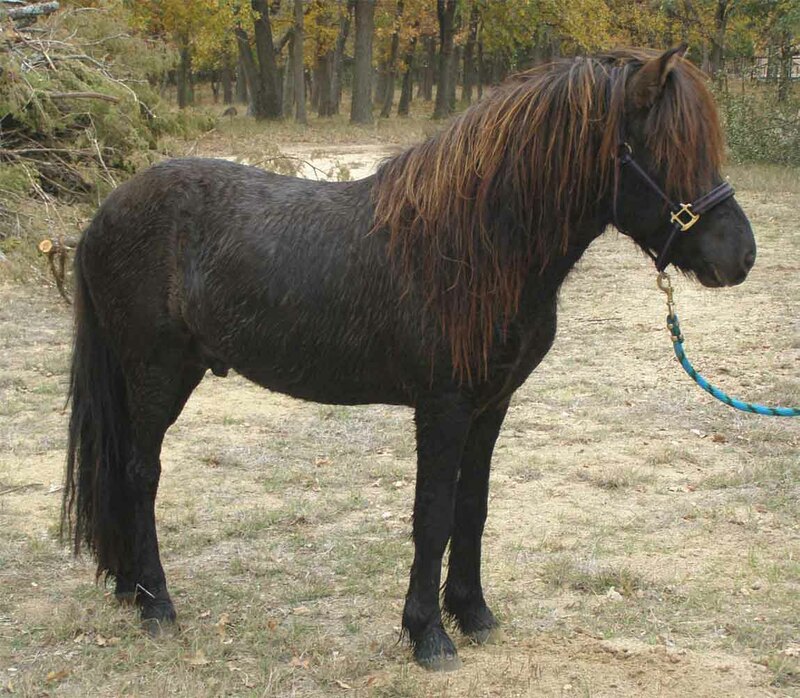 Tappi is 5.5 years of age and is still a stallion. Sörli frá Sauðárkróki and Siða's daughter, Kápa frá Sauðárkr óki. 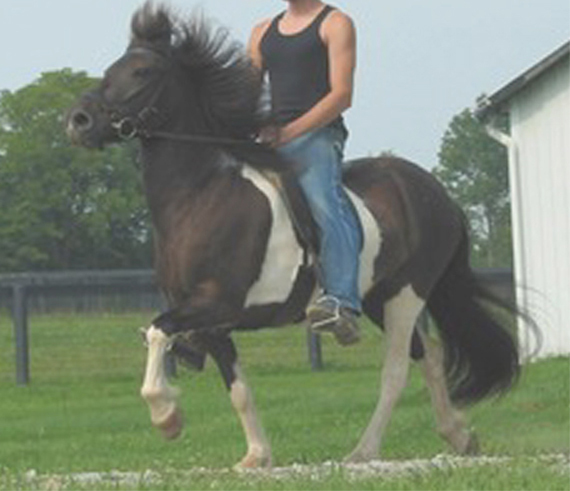 Tappi is very five gaited and shows all gaits in the pasture. already well below his eyes, just like his mother. He is a very handsome stallion. Tappi has a very stable mind and is not bothered by much. 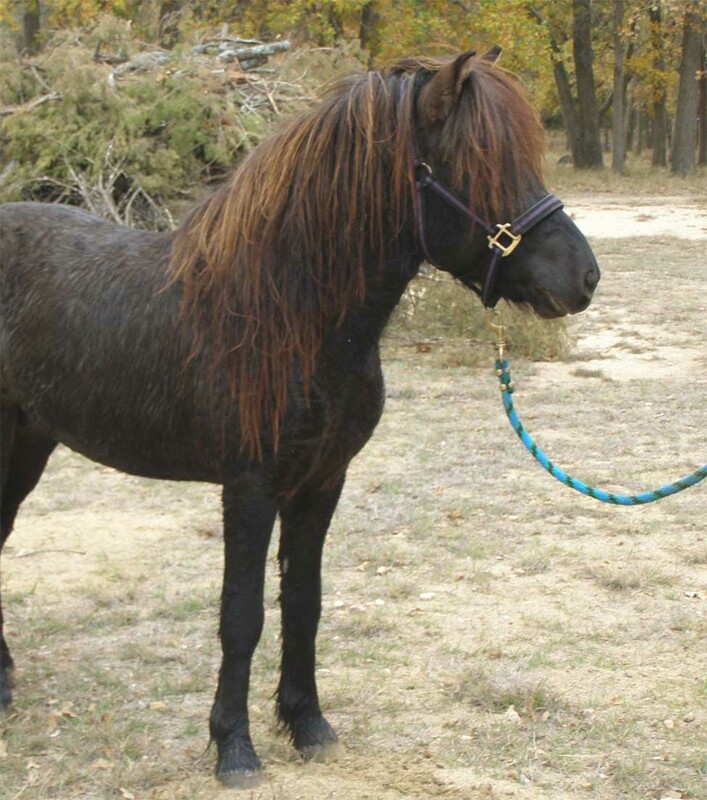 hooves and an 8.5 for both proportions and "mane & tail". Picture taken at real age of four. Tappi definitely shows a lot of Hilmir, both in his conformation and movements. Tappi is quite regal and graceful in motion ... he shows all gaits in the pasture. in her gaits. We have elevated expectations for Sæta. She is rather energetic. dominating mares that were much older and stronger. She is strong willed. The color of all our bay duns are like buckskin, which is somewhat rare in Icelandics. Sæta is in initial training now. So far, she is soft in the mouth and forward going. Sæta at almost four years of age, June 2006. She was four in early July, 2006. Sæta has been through her initial training and is rideable. He is the sire of both Sæta & Tappi. Hilmir is one of the best looking Icelandic stallions I have ever seen. This is Panda, an Icelandic Sheepdog. Of the three types, she is perhaps the rarest, a short haired long legged hunting dog. This is a Cimarron NorStar 4H slant. It was acquired at BigTex Trailers at Mt. Pleasant, Texas. market. The roof is insulated (standard). Check out the quality of the Cimarron trailers. was very impressed. D & D was close to "list price", but not close to Jeff's pricing. Tell Jeff Martin, that Chris sent you ... We get no cut. We just want to see more folks using the best equipment available. Seven used handmade Icelandic Skagfjord/Hesturinn saddles within the USA, below: Svadi, De Luxe(2), Skagfjord, Floki(2), (not yet shown) custom Gull. Svadi is the middle seat, and the Galdur is the wider seat. I have is noticeably better in a number of ways than the regular Gull saddle. One gently used black hand made Skagfjord/Hesturinn Svadi Icelandic saddle for sale at LoneStar, $call. These are hand made saddles in Iceland by Icelandic saddles makers in a small shop in northern Iceland just for the Icelandic horse and for regular Icelandic folks. These are not generally sold out of Iceland as this small saddle shop is not particularly multilingual. 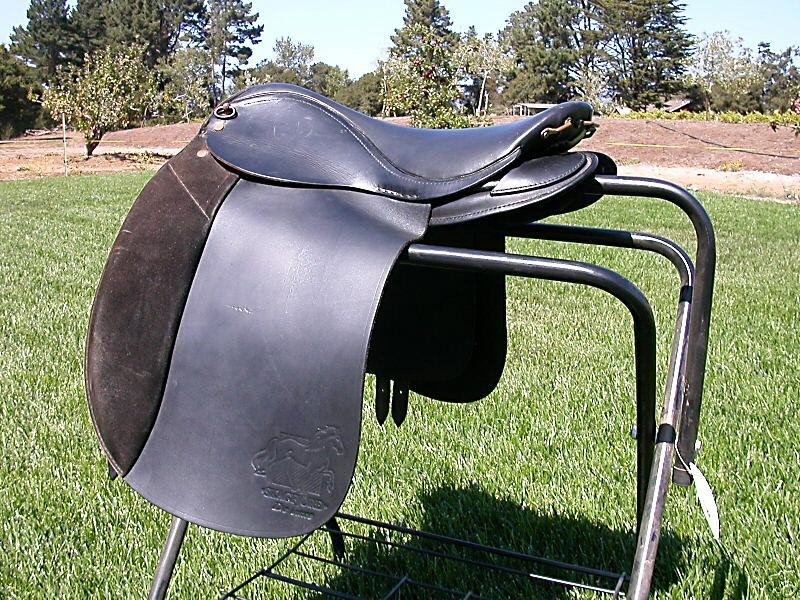 Current prices on saddles from this shop are roughly $2,400+, including VAT taxes. 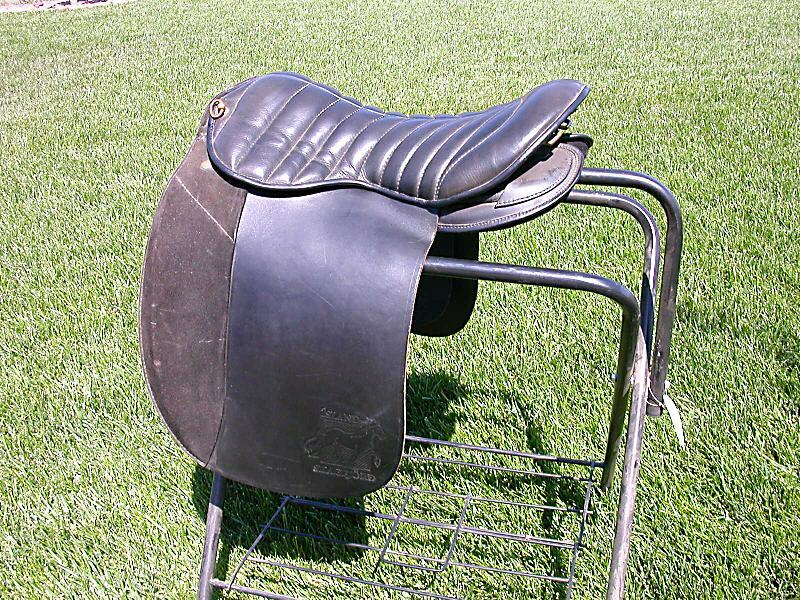 Generally these saddles are a bit narrow and flat, and are considered close contact saddles. 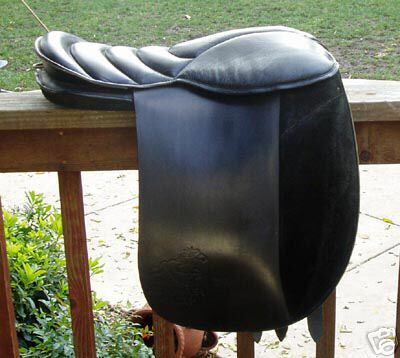 The saddles that are not quilted are even more so. 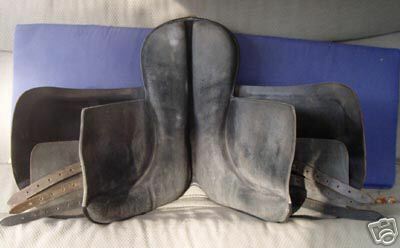 If you want to get the most out of your Icelandic horse, I highly recommend saddles of this type over the mass produced factory saddles, that are much more common place today. 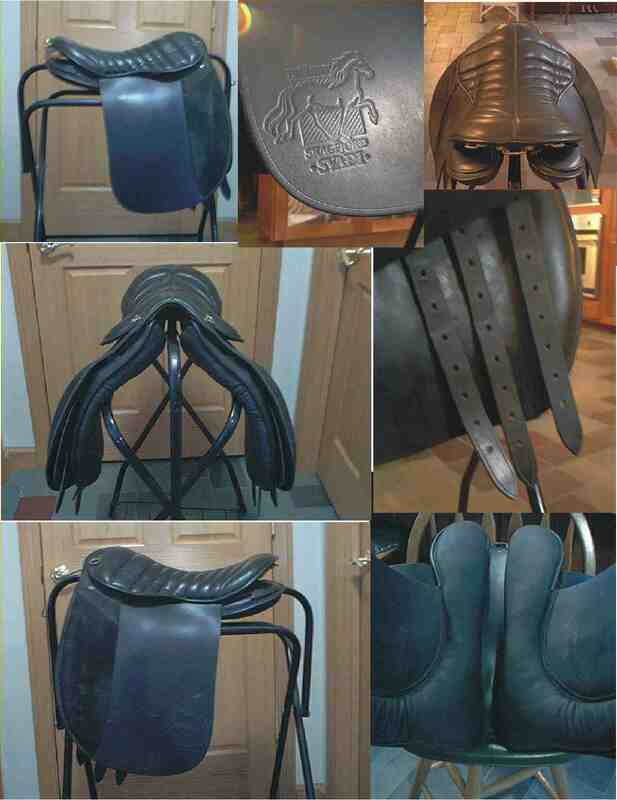 I have other Skagfjord/Hesturinn saddles (Gull, De Luxe, Floki, etc), see below. Two slightly used handmade Skagfjord/Hesturinn "De Luxe" Icelandic saddle(s) for sale, $call. 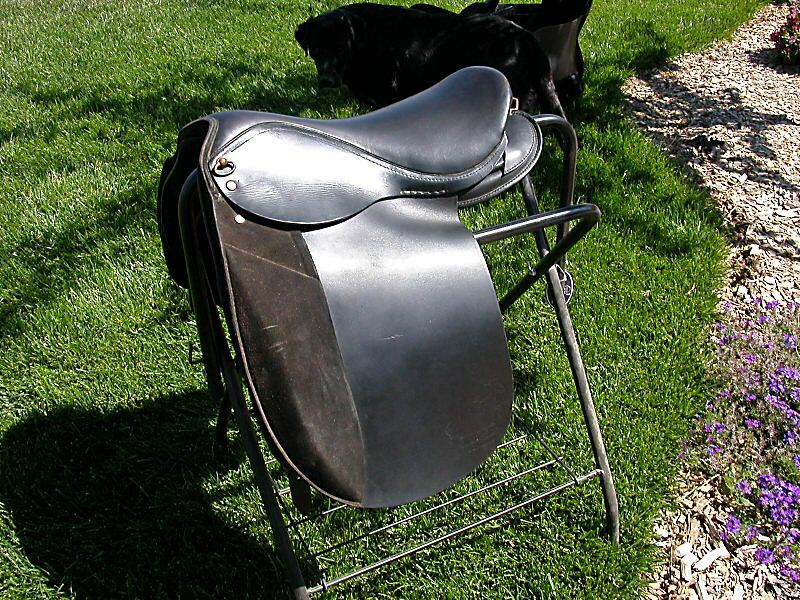 One lightly used handmade Skagfjord/Hesturinn "Skagfjord" Icelandic saddle for sale, $call. 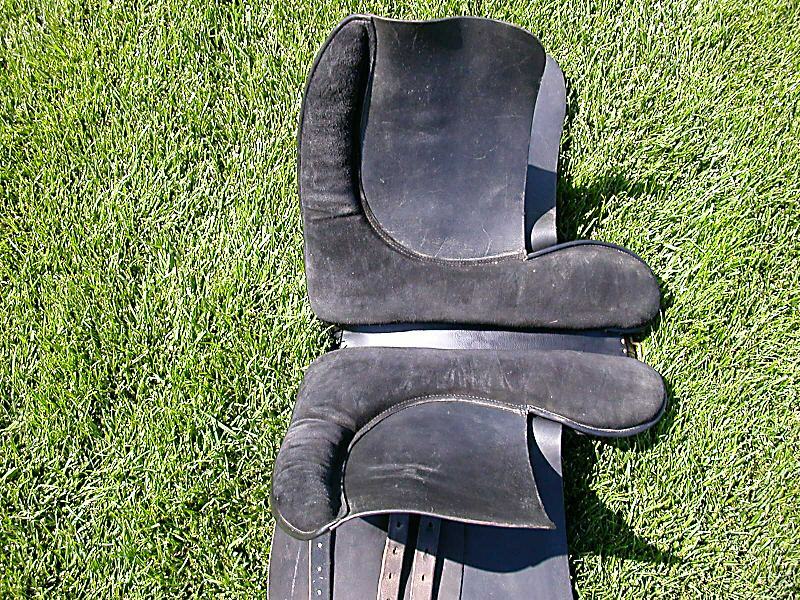 a more classic dressage seat. 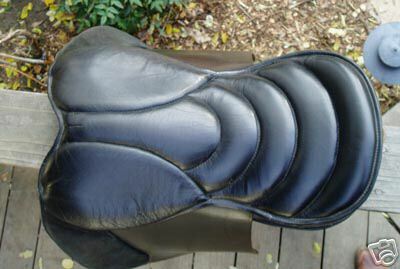 uncommon opportunity to acquire a very unique saddle in like new condition. 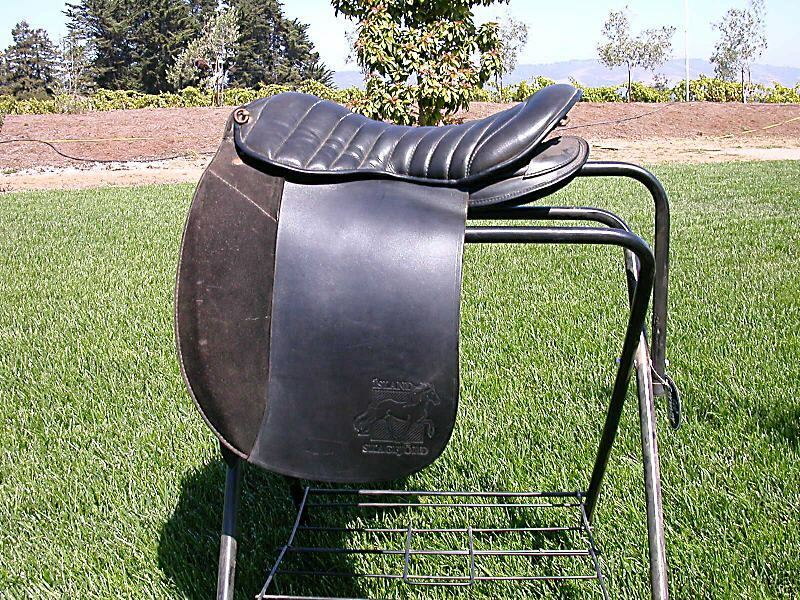 See my comments about this model of saddle in the listing immediately below. 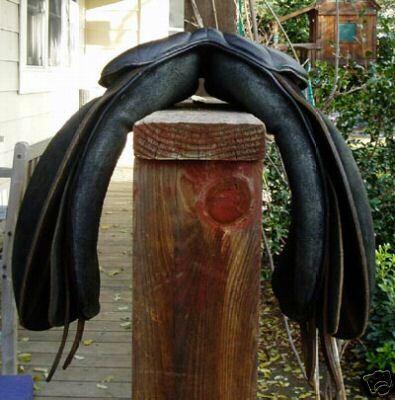 These are very close contact saddles and they're quite rare and unlike most other flexible treed sad dles. As the channel is narrow, I would recommend this for a horse with a well rounded strong back (no back bone sticking up, barrel backed is best). 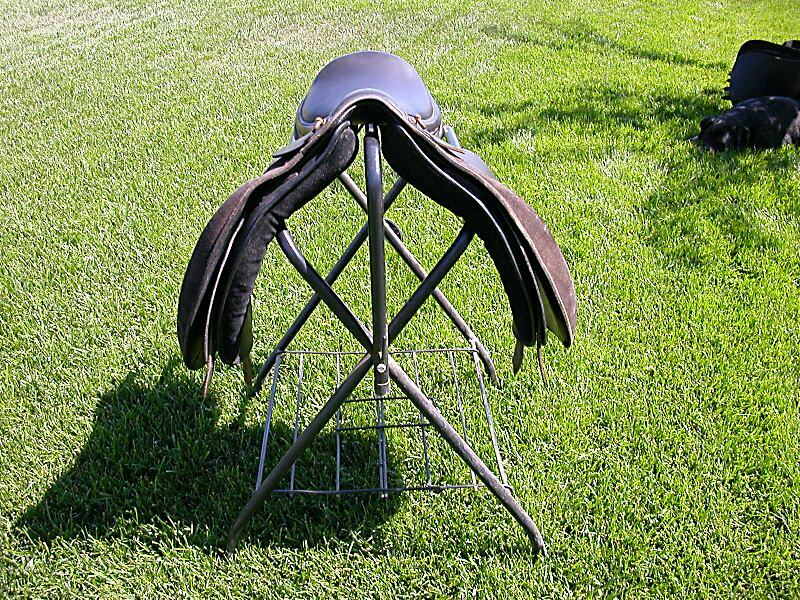 I do not recommend these saddles for heavier people, as it concentrates your weight on the horses back to a smaller area than with a treed saddle. It also requires very good balance. 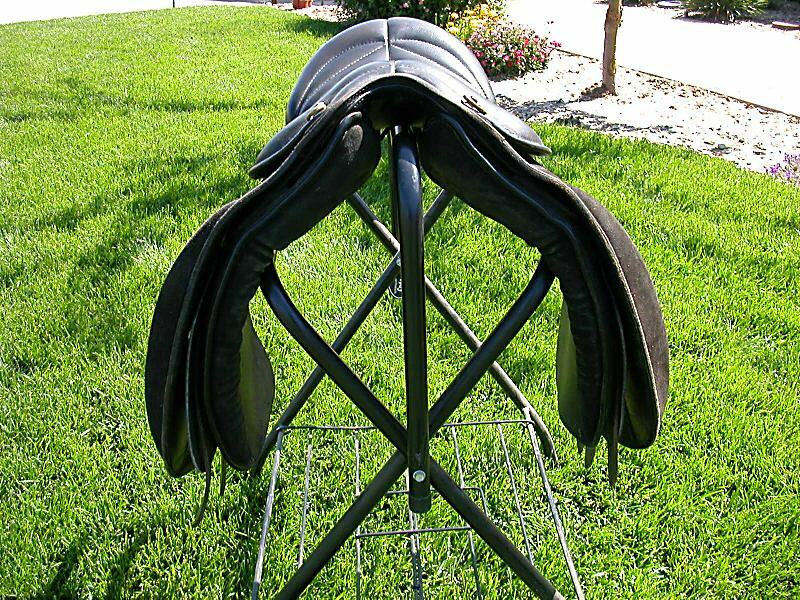 But if you have that and are relatively light weight, you'll love this saddle and so will your horse as it weighs next to nothing. 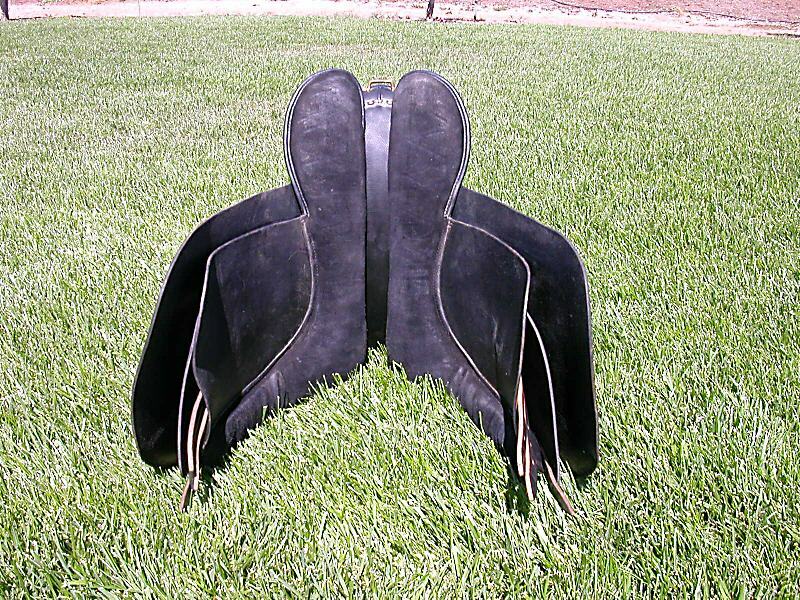 As this saddle allows more freedom of movement, your horse may tolt noticeably better. From this saddle's new owner, "I love the Floki. My boy is tolting like a monster. 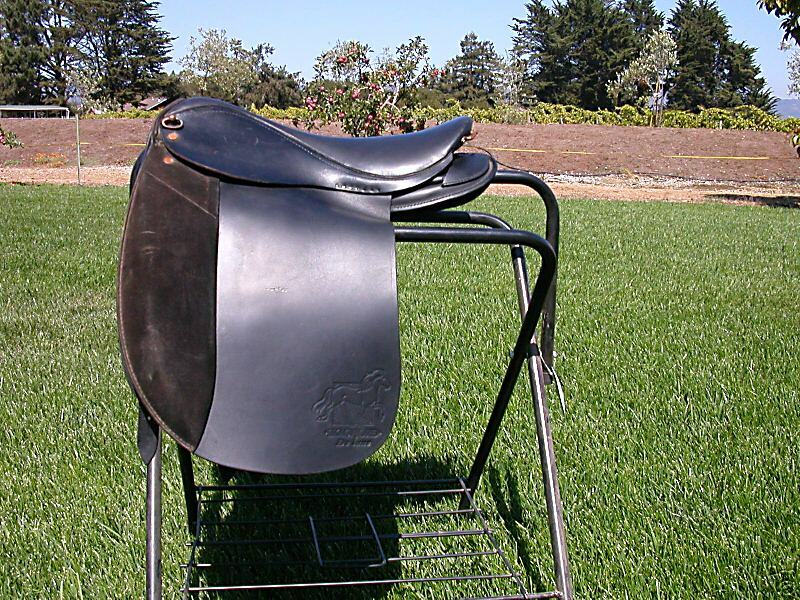 I have just learned that these saddles are no longer being made .... too bad!!! I've been giving Equerry's high quality probiotics to all my horses daily for some time. The results have been quite pronounced. Horses that are hard to put weight on, blossomed on this product. This includes both older horses and very active 4-5 year olds. My youngest horses filled out and have grown more than any other crop that I've yet raised. I've been able to keep weight on lactating broodmares much more easily when the mares are on these probiotics. 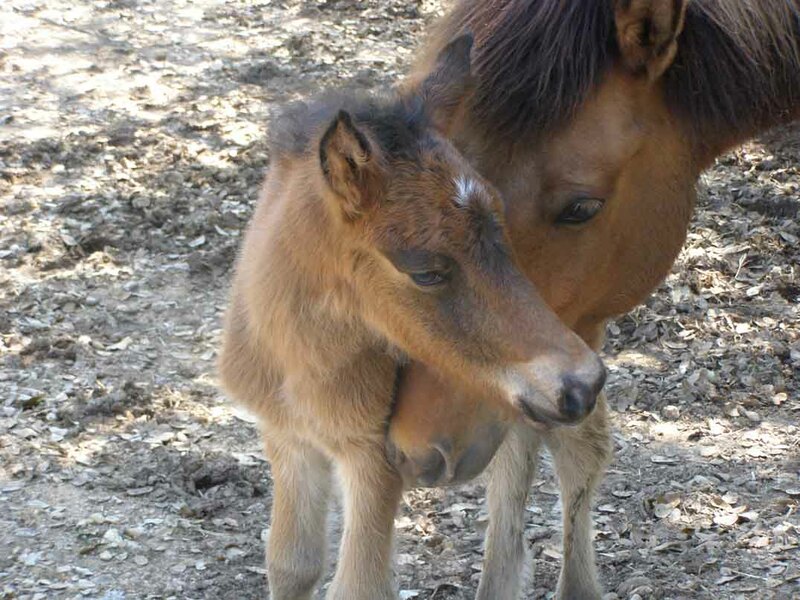 And the foals gain significantly more weight quicker when their mothers have been on them for sometime before birth. The probiotics are encased in wax to help them pass through the very acidic stomach and enter the intestines intact. Probiotics have been attributed with allowing a horse to get between 20% and 25% more out of their existing diet than they would without this digestive aid. Additionally, I haven't experienced any colics with any horses that are on these products. All my horses are lightly grained (lactating broodmares are more heavily grained) twice a day and they are given this "meal" at least once a day. Most get it with each portion of grain. I've practically stopped giving any other supplements as they have a high dose of vitamins also. Though I do still grind flax seed for them daily with a Bunn commercial grade coffee grinder. I've been using Equerry's probiotic products for almost two years. Initially, I used the "Choice" product and then switched over to the more concentrated "Plus". Both come in a "meal" form. I highly recommend Equerry's probiotic products. Compared to other supplements, I find them to be reasonably priced. I feel that they more than pay for themselves with the results. I'd have to spend another 30% on hay and grain to come close to the same results, which I do not think is possible with any amount of food. I could make them fatter, but I couldn't make them look this healthy with just food alone. 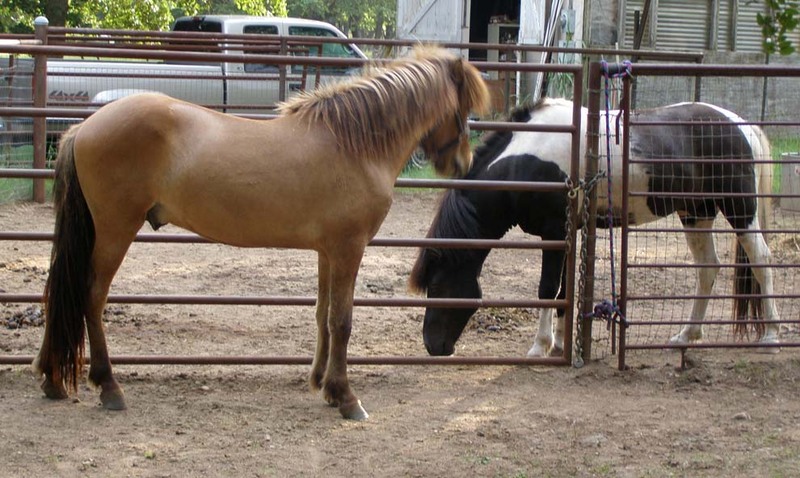 There is a noticeable difference between a fat and a filled out healthy horse. Elja, my oldest horse at eighteen looks as good as any mare that I have that's a half her age, and she acts more like a teenager. With 17 horses, the cost of the probiotics does not come close to even 20% of my food bill, and I'm going through close to 50lb of Equerry's Plus a month. I was getting two 20lb bags at a time, but I'm now switching to the 50lb tub, then 50lb refill bags. I haven't found any other supplement that comes close to the results that I'm experiencing with Equerry's probiotic based products. Their 20+ years of experience is well demonstrated with their results based products. Give "Equerry's Plus" a try. If you are a picky, discerning horse owner that tends to pamper your kids, then I think you'll really like the perceptible results. Be patient, as you'll still be seeing improvements many months after you start this program. Equerry's probiotic Plus is not like other supplements that you give to your horses and hope for the best. You will actually see the difference. It's especially noticeable in your older horses. 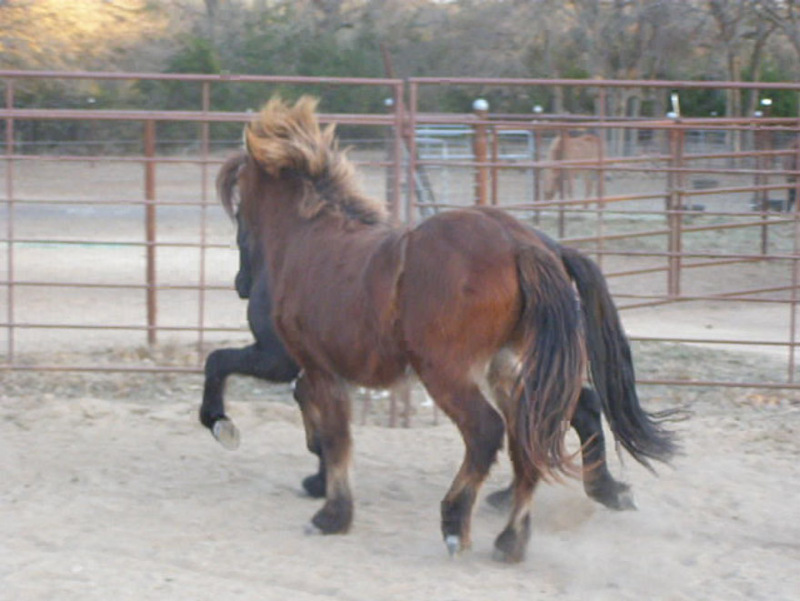 It has given my young stallion, Tappi, so much energy that his current & past trainers didn't want to get on him! ;-) As he just had too much energy for his maturity level. 8-) Of course that was giving him two full scoops a day ... so they cut back to 2 half scoops. Now, he's more focused. Big Grin :) And he's still out running everything they put up against him (getting him stronger & faster for Flying Pace). Chris with the fuzzy Icelandics in Texas recommended them. They are really nice folks! And be sure to read the "Probiotic Thesis" excepts! For horses with above average stress and performance levels. Contains a complete Probiotic Formula. Live Yeast Culture -- Helps relieve stress, balance pH and provides quick enzyme action. A food source for microbial population. Yeast cannot be pelleted; the pelleting process kills the yeast and its value. 5 Species of Microbes -- Digest more nutrients, colonize the gut faster, suppress more pathogens (E.Coli, Salmonella). Encapsulated Microbes -- Pass through the stomach to reach the gut without being destroyed. Maintains steady appetites. More energy and stamina because of better nutrient intake. Better attitude and performance with less stress. 5 Digestive Enzymes -- Quickly digest feed and allow maximum absorption of nutrients. Amino Acids -- Protein building blocks that are readily absorbed into blood stream. Needed Vitamins -- Daily replacement of vitamins for general health, growth and well-being. Proteinated Minerals -- The important major and trace minerals are supplied in every feeding for growth, maintenance and regulatory function. Equerry's contains chellated minerals and proteinated minerals. Proteinated minerals are absorbed faster and more efficiently into the blood stream. Added Selenium -- For selenium deficient feeds and pasture. High Biotin 5 MG -- For healthier skin, hair and hoof.